Over 700 Photos at Mustangworld.com! - Click on the logo! The annual effort from BCMCers Bill Switzer & Bill Lohr! 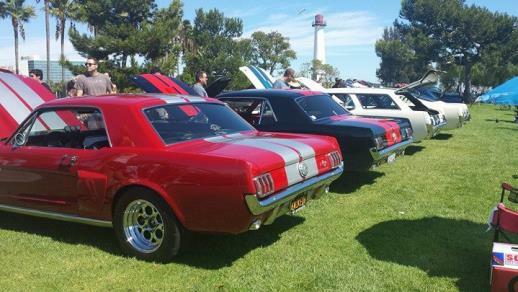 200 Photos From Our 9th Annual Show from our friends at MustangWorld.com! Visit the QMX Follow Up Webpage! Pics - Videos - More! And in the "Who've thought we'd ever link to these guys" category... Someone on this Honda site posted some great, hi-res photos! Click on a logo to check out the stories! What do 100s of Mustangs look like when leaving a show? their great write up with lots of photos! 100s of indivdual show car images. and got every single car on video. Way cool! Mustang Monthly did a feature story on the 2012 show, and even gave us some cover space! Our newest Media Partner is MUSTANG CONNECTION. They have been taking cool vidoes at our shows for years. Check out all the great videos they have to offer on their Facebook Page and YouTube Channel. Support these great guys by Liking them on Facebook or Subscribing to their YouTube channel! You can't miss William the MUSTANG MEDIC at a show... He's at all of our events and always shoots dozens of fun vidoes every year. Stop him and say hi and you'll likely get your Mustang featured, too! Cool Fords has been a long time Media Partner of the BCMC and our shows. Be sure to check out their all new website by clicking above! They do videos now, too - see below! Photos from one of our favorite vendors! 3 VIDEOS - CLICK PLAY! 5 page article in their 1st issue! This great group of Lincoln owners have made our show, their show! They brought 14 MARK VIII's and so we give them their own classes. A GREAT group of enthusiasts! Click the logo to see their video!